Anti-Rotation Training is where it’s at! 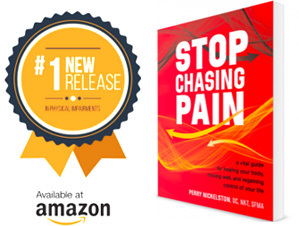 I am very excited to offer the Stop Chasing Pain Anti-Rotation Training Kits now available for purchase. There are several different levels from beginner, intermediate, and advanced. Each kit offers different levels of resistance and equipment to choose from depending on your experience. It”s one of my GO TO movements for assessments, corrections and core workout options. It challenges your core, especially your anti-rotation muscles (obliques). If you don’t own your obliques you don’t own your core. The oblique are fundamental players in ability to transmit force across your body and generate massive amounts of power and energy. It’s all about energy transfer. I have partnered with Anazeo Fitness in creating high quality products that will last through intense workouts. They are designed with YOU in mind and take advantage of my favorite form of resistance training (Variable Resistance Band Training). Band training optimizes the eccentric control of resistance training. That’s the ‘secret sauce’ of muscle growth. The kits offer ropes, cables, bands, handles, hooks, and anchors so you can train anywhere at anytime. You can start with the baseline kit and add equipment as you progress. Or simply be a badass right out of the gate and get the Advanced Kit. Below is a video of me showing the equipment in action doing a regressed Supine Pallof Press Matrix. Each movement is a change in the stabilization requirements of the body. Click Picture to learn more and order the kits. See all the options. Are you ready to play? Time to see just how much anti-rotation control you have. Maintain normal breathing. Do not hold your breath. If you can’t do the movement without holding the breath then decrease the resistance by changing to lighter bands or moving closer towards the attachment point. During the sequence if you have to hold your breath, STOP! That is the point at which the movement is too difficult to perform for you. Distressed breathing in low stability exercises is an indication of nervous system threat. Don’t grip the bar too hard. Maintain normal grip tension. Do not bend the elbows too much. Notice how one side feels compared to the other. Pallor challenges oblique muscles pairing relationships. The weaker side indicated dysfunction. Do more reps on that side. Hold each position for a minimum of 5 seconds preferably 10 seconds. Then move to the next one. Do one round per side. Why do this? Helps to stabilize your torso for controlling rotation. The place most people get hurt. When to do this? Every time you train. Where to do this? Anywhere. Use the door anchor kit if ya need it.